Identifying the molecular mechanisms underlying diseases such as muscular dystrophy, dilated cardiomyopathy, and Hutchinson-Gilford progeria syndrome caused by mutations in the nuclear envelope proteins lamin A/C, emerin, nesprins, and SUN proteins. Although lamins A and C are expressed in almost all differentiated cells, the vast majority of mutations cause very tissue-specific defects in patients, primarily affecting skeletal and cardiac muscle and tendons. 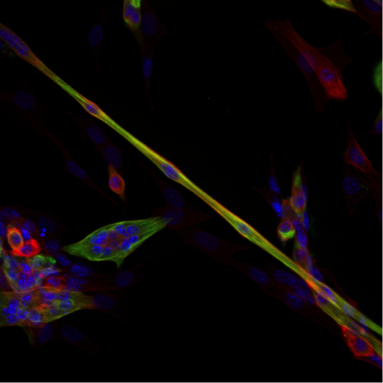 We are investigating three non-mutually exclusive hypotheses, namely that these diseases arise from (i) physical damage to more fragile cells/nuclei, (ii) impaired activation of mechanotransduction pathways required for normal cellular homeostasis, and/or (iii) insufficient regeneration/repair of damaged tissue due to defects in adult stem cell function and maintenance. Experimental tools include patient-derived induced pluripotent stem cells (iPSCs) that can be differentiated into cardiac myocytes and other lineages, mouse models of the diverse laminopathies, and in vitro experiments, including live-cell microscopy and cell and molecular biology approaches. These approaches let us investigate the effect of specific mutations on cellular structure and function, while also teaching us more about the normal function of these proteins. An improved understanding of the molecular mechanisms underlying the currently incurable laminopathies will be crucial to develop novel therapeutic approaches to treat or even cure these devastating diseases. Proposed mechanisms by which mutations in lamins and other nuclear envelope proteins can cause a broad spectrum of human diseases, including muscle-specific phenotypes. Understanding the role of nuclear mechanics in cell migration in 3-D environments and the consequences of altered nuclear envelope composition in human cancers. Aberrations in nuclear morphology, such as increase in nuclear size, change in shape, and loss of nuclear domains, are commonly used to identify cancerous tissue. It remains unclear, however, whether the disturbed nuclear structure directly contributes to the cancer pathology or is merely a consequence of other events occurring during tumor initiation and progression. 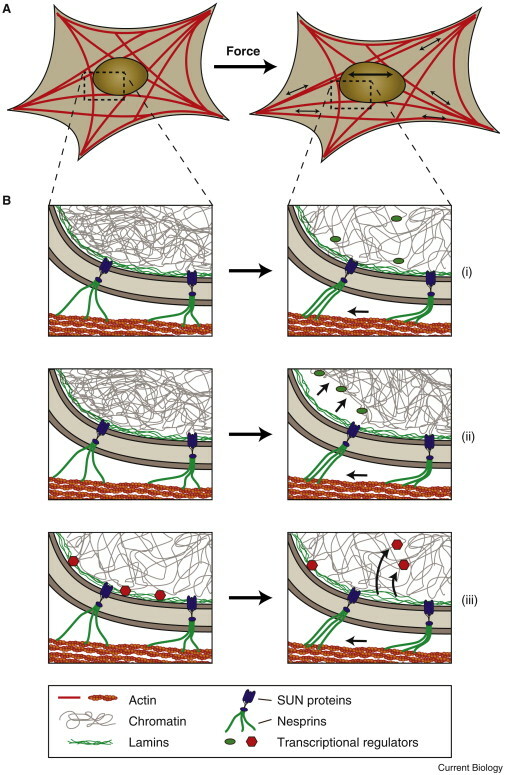 One interesting hypothesis derived from our previous work on nuclear mechanics is that altered nuclear plasticity could provide significant advantages to metastatic cancer cells. Often, the ability of cells to pass through narrow openings or spaces is limited by the size and deformability of the nucleus. Increased nuclear plasticity, caused by changes in the expression of lamins or LBR, or altered chromatin configuration, could then facilitate passage of cancer cells through narrow spaces or pores, thereby promoting invasion and metastasis. Previous work from our laboratory demonstrated that neutrophils, highly mobile immune cells that are characterized by particularly low levels of lamins and high levels of LBR, are especially well suited to move through micron-sized constrictions. Our recent studies suggest that metastatic cancer cells may employ very similar strategies. We are using microfabrication techniques combined with advanced live-cell imaging and fluorescent reporters to investigate how cells are able to squeeze their large and typically rigid nucleus through microscopic constrictions mimicking physiological interstitial spaces. At the same time, we are assessing the functional consequences of the physical stress exerted on the nucleus during such migration through confining environments. In vitro and in vivo experiments are complemented with the analysis of patient-derived samples. Insights from these study may help to identify particularly invasive cancer cells and to develop novel therapeutic approaches specifically targeting metastatic cancer cells. Elucidating how cells ‘sense’ their physical environment to activate mechanosensitive signaling pathways. Virtually all cells respond to mechanical stimuli with the activation of specific signaling pathways and induction of mechanosensitive genes. This ‘mechanotransduction’ response enables cells to adjust to their constantly changing physical environment and, for example, drives muscle growth (hypertrophy) in response to exercise, adaptation of bone density to mechanical load, tissue development, and even the interaction/communication between immune cells. While many of the signaling pathways activated by mechanical stimuli are already well characterized, the underlying molecular ‘mechanosensors’ that are responsible for transducing mechanical input into biochemical responses to initiate the specific signaling pathways remain incompletely understood. Recent findings by us and others strongly suggest that the nucleus itself plays a crucial role in the cellular mechanotransduction process. We are using cutting-edge cell and molecular biology approaches combined with novel molecular manipulation and biophysical assays to identify the role of nuclear envelope proteins in mechanotransduction, both in normal cells and when perturbed by disease-causing mutations. By using microfabrication and tissue engineering approaches to create in vitro environments that mimic physiological tissues, we can study the response of individual cells to precisely controlled physical stimuli at high resolution.